Born & raised on a farm near Winters, Texas. Adair Manning and Alexander are all family surnames. Adair had 5 sisters in all, birth order unknown: Rose, Vila, Lona, Noma and Eunice. Adair was the youngest by many years. Adair went into the military 25 NOV 1940 Abilene, Texas and worked on planes in the army, including the Enola Gaye that dropped atomic bomb. He also got seasick on a ship once. He would send money home to his mother and grandmother and kept up the taxes on the farm for them. He hardly kept a penny for himself. Later, Adair and Ruthie had a store at Buchanan Lake for two years (after George Anna graduated high school). In order, they lived in Coleman, Llano, Odessa, Buchanan, Odessa again (George Anna stayed), Houston, Lafayette, Kilgore (where Billy met Karen), then back to Odessa. 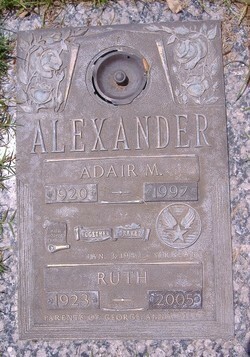 Adair's father was Charlie Alexander and his mother was Eula; surname either Adair or Manning.